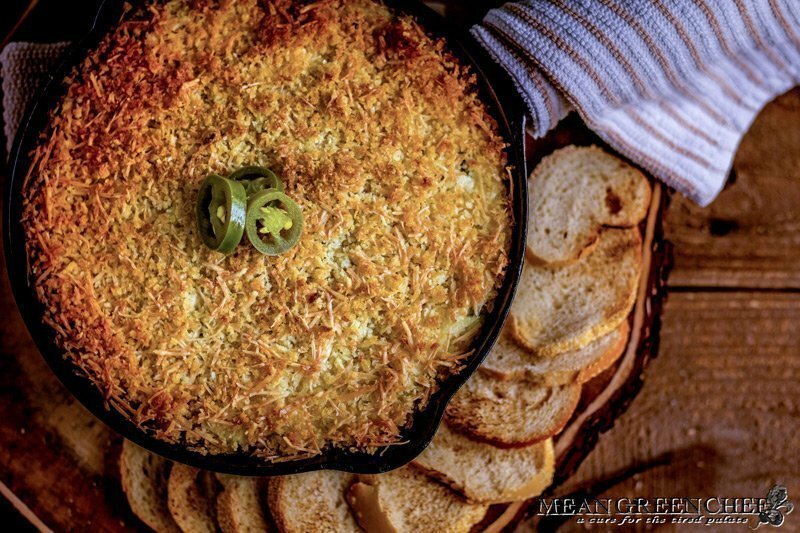 Our ultra creamy Jalapeno Popper Dip is perfect for any get together, and it’s ultra-easy to execute. We started making this for super bowl parties years back when it became popular and its continued to be a mainstay in appetizer spreads. If you’ve shied away from this dip due to the heat of the peppers, fear not! The cream cheese is wildly cooling and we also used a tamed variety of jalapenos that has great flavor but a mild bite. Don’t get me wrong, we love spicy food, but not everyone feels the same way! You can choose to go either way. I mentioned the Tamed Jalapenos that we’ve been using (this is not a paid advertisement) just a recommendation. Mezzetta has a great selection of jarred jalapenos ranging from the Tamed that we use here to medium, and Hot! We’ve tried them all, they’re crispy fresh and pop with flavor. So pick your heat level and go for it, find them in the condiment section in your local grocery store. All the great flavor an texture of a classic jalapeño popper without the hassle! Double or triple this recipe for large parties! Fresh jalapenos work in this recipe too. Of course the spice will increase, you can adjust for flavor as you go. Taste with each addition of peppers to make sure your comfortable with the heat. You can also serve with, Ritz, toasted pita, blue tortilla chips, corn chips, or your favorite cracker. Our ultra creamy Jalapeño Popper Dip is perfect for any get together, and it's ultra-easy to execute. Add the cream cheese, mayonnaise, sour cream, jalapenos, green chilies, and Monterey Jack to a large mixing bowl. In a small bowl combine the Panko, Extra Virgin Olive Oil, and Parmesan cheese and toss until combined. Add the cream cheese filling to an ungreased 1.5 qt baking dish or small cast iron pan (as pictured). Sprinkle the Panko mix over the top of the cream cheese mixture. Bake uncovered for 20-25 minutes or until golden brown. Remove from the oven and allow the dip to cool for 5-10 minutes, serve warm with with sliced toasted baguette, chips or crackers. Best eaten the same day as prepared, but can be stored, covered tightly, in the refrigerator up to 5 days. If you’re looking for some other inspirational appetizer recipes, then be sure to check out our other great recipes! This was absolutely amazing. Great texture and easy to make. I used a 10 inch cast iron skillet. It was yummy the next day too. I love this dip. I have always used another recipe that was similar to this but not the mayo, sour cream or bread crumbs. I tried it this way and WOW this one is so much better! Thanks!